Book Launch was held at Istanbul Commerce University on Monday, 14th April 2008. First Minister of Culture and present UNICEF President in Turkey Sir Talat Halman, Prof Dr Kemal Cicek, Sumerology Expert Muazzez Ilmiye Cig, Local and International Media, Diplomatic Missions, Turkish Historical Society, Academic Staff from various universities, some US Nationals (some have taken the Turkish Citizenship now), Mr Sukru Aya's Turkish Armenian school mates from Robert College were among the guests. 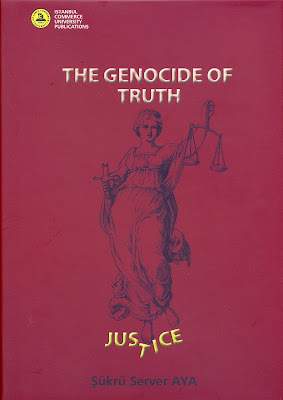 . . . .
We Congratulate Sukru Server Aya On His New Book "Genocide Of Truth" and would like him to continue to further his investigative research work. He has had no time to prepare his new articles for our site due to his very time consuming book work until now. Hoş geldiniz – Welcome – Bienne venue – Vilkommen – Şalom – Parev – Merhaba and Salute in all languages of the World! Dear Ladies, Gentlemen, members of local and foreign media and diplomatic missions! My much valued personal or ideal sharing friends! Guests, that have kindly accepted our invitation! Thank you all for coming! Permit me to inform you that among the audience, there is a very young doctor, code named Gokalp, who calls me dede or grandpa! He is the curious person like me, who sorted and found out the headlines, which you will observe in the PP show. He came from Germany and this is the first time we see each other. Again, another valued friend First-Minister of Culture and present UNICEF President in Turkey, Sir Talat Halman came all the way from Ankara just for a few hours as part of his sincere efforts to convey GOOD WILL, COMPASSION and Love for all parties! This is what he teaches in Ankara Bilkent University as Dean of Humanities. I whole heartedly thank Rector Ates Vuran and his much valued University team, for taking the trouble of evaluating my research of some 3 - 4 years, and had the courage to publish it. In USA, U.K. or most Western countries, nobody would dare touch this hot potato! In Turkey too, most people prefer to bypass it as well! It is TABOO to say anything opposing the GENOCIDE FANFARE! What would they do to me in France or Switzerland, for a crime such as laying their own writings in front of them? Or penalize me for inviting them to look at the evidence, based on their own records? Even in Turkey when you walk into a bookstore, you will find plenty books even translated in Turkish, let alone a multitude of slandering books of literature, with sprinkles of this topic, which immediately gives a gloss to the book regardless how junk it may be, and pays back! May be some notice that in our TV media, flash young writers get plenty invitations to speak in favor of the Genocide MYTH, even though they make scenarios usually distorting facts! Several world-wide authorities, Turkish or of other nationality, are not welcome if they may present the other side of the fake coin. 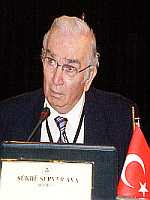 Ex Ambassador Lütem, calls all this “The Genocide Industry”. We have plenty evidence for generous research or other funds, generously allowed for propagating this subject in and out of Turkey, reminding some like me of the old time “His Master Voice” records. 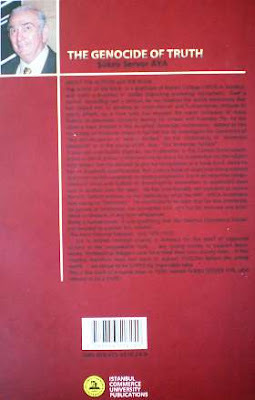 My personal beliefs, ethics and ideals are not for LEASE or SALE, but are for FREE MIND SHARING … and I thank ALL OF YOU FOR SPARING or SPENDING this very valuable section of our remaining lifetime, in search or support of TRUTH and human DECENCY, if not JUSTICE, the standing of which has been shown on my book cover! I am happily indebted to TWO very old friends of mine of Turkish Armenian ethnicity! One of them is loved as a father by more than 16.000 students, whom he taught and is still “teaching accounting” for more than 50 years. I bet his students would have made, a much better adding-subtracting job, about the POPULATION controversy slides you will see. Although they have their own children, they raised a Turkish girl until marriage. We shared their joy, because we were all of the same family, flesh, blood, ideal and understanding. My other younger (?) friend, nearing his 80s, is a manufacturer providing jobs to more than 300 families and he is closer and most reliable among many I know! In our school, business and daily life, we never thought and still do not think of nationality or faith or other features we inherit when we are born! You cannot imagine, how many persons in my line of thinking are disturbed with the increasing discrimination among humans, eroding our compassion. Of particular value of appreciation, there are few web sites that I am acquainted with. One of them is the TURKISH FORUM you may already heard of. Some of their leaders are here. The other web site is run by three young Armenians of Turkish origin living in Canada-Australia-Britain and the WebSite has done a tremendous discovery in the past two and a half years. Many of us write and follow the postings of this important OPEN FORUM in English, which has tens of thousands readers all over the world, and which offers a large Electronic free book library, easily accessible! The same fact applies to several Turkish historians, who JUMP into conclusions by reading ONLY WHAT SUITS them and give speeches or hold conferences, where people that they do not know if they applaud them, are not let in to listen! Even persons aged to be their fathers, old graduates of the school they are now teaching, and in the same buildings where American missionary teachers taught us ethics, debate and free thinking… are not admitted now! Such dogmatic few Universities, sympathize with anything fashionable that suits them, be head covers or closed circuit teachings! A chapter of my book is titled “Divinity for bigotry and anarchy”. i have been reading your book. it's a monumental achievement. but it seems to me you take Armenians much more seriously than I do. ASBAREZ and its 500,000 readers is a myth. No Armenian publication has more than a handful of readers, and those that have more than 10,000 are distributed freely mostly in Los Angeles-- they survive on advertisements. than adoring me, for telling you lies." You are welcome to quote me anonymously of course. I too have no desire to be targeted for assassination by fanatics (please, quote this line also). Will soon see how right he is in his statement. I also wish to say Şalom and express my thanks to the valued members and president of the QUINCENTENNIAL Foundation of Turkish Jews for their togetherness of souls, now over 500 years of pleasure! My PP presentation, tries to squeeze 120 years of history, or some 30.000 pages of reading or scanning, and some 700 pages of EXCERPTS in only 17 minutes. Do you think that it is easy to summarize such a long and intricate history in such a short time? I named the presentation as only few “sample notes” from the book. If you wish to read the rest, it is about 700 pages, over 1500 verbatim excerpts plus references, notes and other documents, which may take you over a month to read all! One local newspaper columnist had proudly written an article, that he read a book “size of a brick” and four others and he was sure of Genocide. I wrote him an open letter, reminded him of my years of reading, and added that my book is heavier and thicker than a brick, if this is how he evaluates serious topics. Esteemed guests, in the later part of the show, please observe the article of a prophetic reporter back in 1915 about Armenian Diaspora propaganda! How correct he proved to be a century later ! In his words, I simply REFUSED TO BE TAKEN AS A DUPE and what triggered this research was an 8-page article in National Geographic March 2004 about Armenia, in which the Genocide story and land ownership arguments were laid down politically in a Geographic magazine. Those who enter my name in the goggle, can read about that 4 year old adventure and the indifference of the Turkish public and media. I had tried to put an add by paying from my pocket asking the attention of the people to REACT this scandalous essay printed in all foreign language issues of the magazine, but of course not in the Turkish edition! The Turkish one had some birds etc to substitute the 8 page essay! Would you call this press ethics? All of the Turkish advertisers of this reputed magazine, continued the good business closing eyes … and some newspapers were printing the advertisements of the magazine, with no word of the news they new, about this shameful cheating! There was only ONE Turkish paper who accepted my “public call add” against payment. So, when Diaspora speakers who did not permit Patriarch Mutafyan to address in a U.S. University, speak of “Turkish State Propaganda” and payments, I laugh, but not with my front side! It is this GIGANTIC negligence and lack of curiosity of several scholars, which dragged me in this research. Ex-minister of Health and Culture, Mr. Bulent Akarcali, when he had a chance to argue with me on the subject, asked me to write a book. I said, “I am not a scholar, I have no title, who would care about what I say”? He answered that, since I was an outside reader, I could be neutral! I had no ambitions or objects I must serve, and that was “different”! My convincer Mr. Akarcali, could not be here on this very important day, but it was through his introduction that Rector Ates Vuran (if he were to be an Indian… we would have called him STRIKING FIRE) indeed proved to be FIRE-hot on this challenging debate and STRIKED by publishing this book, all by his Independent University, with no strings of any sort ever attached. Being a business person, I am extremely honored that this University accepted to study “my hair counting study on several sheep or goat skins” or so many books, with given references. I am no writer, I do not hold any titles, but by now, I understand that earning some degrees or prizes are not that hard, when it is done for a chair or benefit! The hard part, is to DOUBT and SEARCH as for as many as possible for comparison, and then have the guts to stand up and speak, challenging many impostors who may want to defy what I have excerpted and be ready for a multitude of slanders and labels to be affixed on my personality, if not on the book. I would not wonder if some persons still carrying a Turkish ID, but fed by some institutes under ZOR or other IAN ending names, will immediately try to counter attack this research, which will self-shooting! I must confess that I did not WRITE this book, except for very few paragraphs needing my guidance and some commentary notes. I am just a READER like ONE OF YOU… May be I was curious on the subject, because I have too many good friends of Armenian ethnicity, and I wanted to find out if I bear any responsibility because of my birth. My findings are here in this book. If the PPS or the book is different news to you, you may ask other historians, why they did not read by profession “OTHER SOURCES” who were neutral or pro-Armenian? What I found out and compiled was there, too many long years ahead of me! For example many scholars who did not do their job properly, could freely speak up, as if what they say is totally TRUE! When I read that in Trabzon, where about 6-7000 Armenians lived, over 10.000 were drowned by Turks, I asked myself: it is not that so many people never lived there and the available small boats would not hold in total more than a few hundreds, but all ports being blockaded by the Allied Navy, how so many people can be drowned in few days? Why the Allied Navy saw no corpses? There are no sharks in the Black sea to feast over 10.000 corpses… The reply is again in the Reno Gazette, because these are IMPOSSİBLE STORIES… BUT THE WORLD READILY WANTS TO ACCEPT THESE PALAVERS because -Christians never Lie- and -all Moslems have harems, they are unspeakable and are criminals by nature-. My research proves by LOGIC and available written evidence that there was NO CAUSE, NO TIME, NO PLACE, NO MEANS, NO DATES, NO MURDER TOOLS, NO MASS GRAVES, NO RELIABLE EYEWITNESSES, NO DOCUMENTS (other than few forgeries) and NO COURT CASE and NO VERDICT… NOT EVEN AN OPEN TALK DEBATE! The CUP Government had already court martial more than 1600 persons, executed some 67, penalized the rest other than 400 found innocent, for their wrong doings during the relocation. Those who had all the archives searched after Mudros in full in 1919, could not find a single evidence to be able to open a court case against any of the 144 dignitaries held there for two and a half years in Malta to be put on trial, for which NO legal documents could be found anywhere. After you watch the PP Show, you will understand that THIS “GENOCIDE MUPPET SHOW” MUST GO ON, so that those behind the stage, which is very small but loudmouth group within the Diaspora, keep COLLECTING MONEY for DIVERSE REASONS by selling “grudge and hate” as their psychic marketing product. Why should they care for the poor people in Armenia or the fate of the desperate workers in Turkey? Why they invest in monuments, museums of hatred… instead of investing for good in Armenia? Or, worry if they upset the long time comfort of the Turkish Armenian community which does not pay them or even worse provoke some idiot Turkish fanatics! Dear guests this is not truly a friction between races, faiths or nations… We surely bilaterally shared some dramas highly aggravated by the “trigger-happy looting mood of some humpabets or gang leaders! But this new myth was INVENTED after 1965 to put the Armenian communities in different parts of the World together, to do as told and pay for security when asked. And this grudge circulating pump works at full speed in every country of the world successfully. This is a struggle between very smart invisible swindlers (or rascals) who can arson fires and keep them aflame, whilst the benevolent, good wishing people who don’t understand and do not react are respected as DUPES! The majority of the Diaspora, cannot even read or think anything different from what they are told… They MUST BELIEVE IN THE EXISTENCE OF THE MONSTER… otherwise their fury would be replaced by compassion! I thank you sincerely for devoting your valuable time… If you can escape from being called a DUPE, this should justify your patience and sharing these breaths of your life with us. I salute all of you, with my deepest thanks and the honor of being ONE OF YOU! I sincerely thank many of my American College friends for being here and conveying their compliments to the Rector and the University by sending these flowers. After the show, I will be ready to take few questions within permitted time, better written on some paper or last note pages of the PPS booklet, available for those who could not read or see because of distance. Those which cannot be answered because of time, will be tried to be answered by e-mail, in due course! The text of this speech is available in English or Turkish translation, in limited copies at the exit, for foreign and local press. Both texts can be transmitted by E-mail later, but on written request! The Turkish translation of the PPS has not been prepared! This presentation is aimed for persons who can read in English. Interested Turkish correspondents can easily have it translated! Another Turkish but shorter version of this research or book is ready for printing within the next few months hopefully to be decided by Mr. Akarcali. Thank you all most cordially! The G E N O C I D E of T R U T H ! (24) The Success Of Armenian Lobbies And Diaspora Org. All rights reserved. Except for brief quotations in a review, this book, or any part thereof, may not be reproduced, stored in or introduced into a retrieval system, or transmitted, in any form or by any means, electronic, mechanical, photocopying, recording or otherwise. This book is copyrighted. 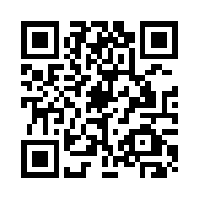 You may view and download the file, but you may not copy the file or share or forward it to any other person. Part 2: "THE ARMENIAN QUESTION Before the Peace Conference"
Submitted by the Armenian delegation on Feb. 26th, 1919. (Clarification of all acts of treason, revolutions, braveries and asking in return more than half of Anatolia, [free of non-Christian elements]. Part 4: "NEAR EAST RELIEF REPORT" Joint resolution of the U.S. Senate & Congress, accepted unanimously on April 22, 1922. The contents of this official document belies the arguments and reasons enlisted in HS-106. Though many other references were made in H5-106, "this one was overlooked or by-passed. Why?" Part 5: Documents: Adjustment of Payments due to United States by Turkey, Sept. 1937.